While reading one of my favorite blogger’s posts this morning about a book called The Happiness Dare, I was inspired to take the Happiness Test. Read Kariann’s post to be inspired too and then take the test here to find out what floats YOUR boat. I was not surprised AT ALL to find that I’m a “Relater”!! Everything I do and am passionate about has to do with people. It’s the reason I’m a speaker of truth and that I create my Empowordment Cards! My secondary is as an “Experiencer”. I love to take in everything through my senses (sometimes a bit overwhelming!) and enjoy making experiences for others. 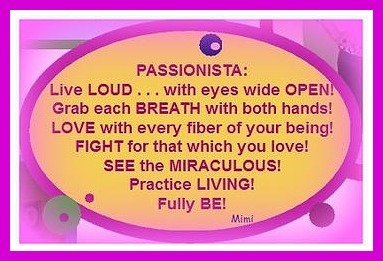 I call myself the Creator Of Experiences (or COE) of Passionista At Large. On my wish and dream list is organizing retreats and events for women!! It WILL happen! I felt like this was something you might want to investigate for yourself. I’ve just ordered the book and can’t wait to read it!! Let me know what YOU find out in the comments below. It’s really very interesting. And take the dare. I am! Next postSparkle & Shine Calendar is Here!